The Amsterdam Smart Citizens Lab empowers a vivid community of committed citizens to use inexpensive, open source technology to understand their environments (the air they breathe, the noise they hear, the water they drink & swim in, and the soil they grow on) better and to take action based on their findings. They are coached by experts and hackers who put their knowledge to use in answering the participants’ questions, and help them to measure, analyze, and interpret data that would have been beyond their reach a few years ago. This is expected to lead to more engagement, more insight, better-informed dialogues between citizens and their governments, and in the end to more enjoyable, liveable, and creative cities. While our environments have a large impact on our short and long term health, the data to understand them are sparse, obscure, and often inadequate. Pollution is measured in averages and then modeled to fill in the gaps, whereas their levels vary hugely from street to street and moment to moment. Some places can even be considered ‘toxic’ during some moments of the day. Even so, the available data are taken to be ‘objective’, whilst decisions made about what to measure, their norms, and interpretations, are subjective and political. Citizens, meanwhile, suffer: from pollution, lack of knowledge and trust in measurement bodies, and from a lack of options to act. 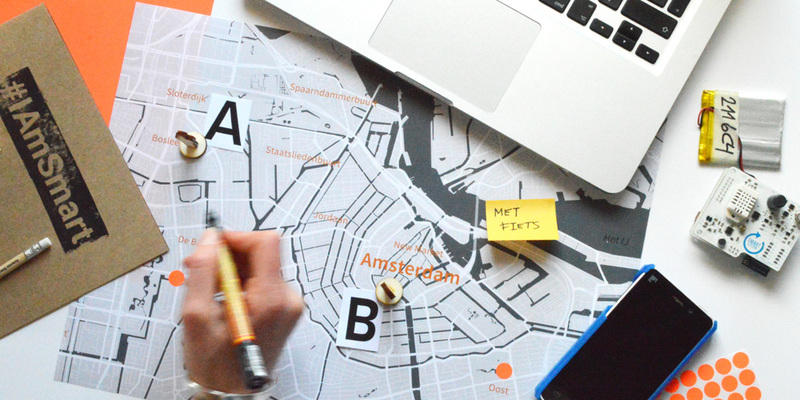 The Amsterdam Smart Citizens Lab aims to provide a solution. It is open to inquisitive people who are interested in learning about their surroundings and want to team up to share their skills and time. Collectively they draft measuring strategies and campaigns, build or appropriate sensors, collect data, and interpret and act on the outcomes. The Lab builds on the existing infrastructures and communities from the Amsterdam Fablab & Open Wetlab, and consists of various meetings and group activities that last over long stretches of time. It was conceived and started by the Amsterdam-based media lab Waag Society, which has been researching and developing emergent technologies for social innovation for over 20 years. The Lab has attracted many partners (hackers, universities, city officials, official measuring bodies & the city of Amsterdam) to provide experts and expertise, and to learn from the outcomes. From over almost a hundred enthusiasts at the start in 2014, the community has grown to over 600 that are currently registered at the meetup page. They are a mixed group of old & new Amsterdamers, including many people from abroad that are interested in contributing to the city they live in. The results, as well as the methodology, are described in Creative Commons Licensed publications and on the Web. Our aim is to extend and verify our methodology, thereby helping people all around the world to implement it, check it, expand it, and turn their own participatory sensing projects into a success. We feel like we’re part of the birth and growth of a movement of citizens that know where they can get the knowledge and support to use public networks of open source sensors and eventually use self-gathered data to make smarter choices. By embracing this bottom-up movement and enabling creativity, we want to facilitate citizens to maximize their capacity to act. With more data and more evenly distributed knowledge, we see impactful dialogues between citizens and governments arising. In short: we feel we are on to something and will continue in these efforts. Waag Society—institute for art, science and technology—is a pioneer in the field of digital media. Over the past 22 years, the foundation has developed into an institution of international stature, a platform for artistic research and experimentation, and has become both a catalyst for events and a breeding ground for cultural and social innovation. Waag Society explores emerging technologies, and provides art and culture a central role in the designing of new applications for novel advances in science and technology. Artists and designers know better than anyone that they must question technology in order to get to the bottom of things, overthrow sacred cows, stimulate imagination and fantasy, create unexpected connections, and—above all—search for meaning. Waag Society runs the ASCL in conjunction with Gemeente Amsterdam, HvA, RIVM, SenseMakers, Alterra, AMS, Amsterdam Economic Board, KNMI, ECN, Fablab Amsterdam, and the Open Wetlab; and internationally with IAAC, Fablab Barcelona, Microgiants, FutureEverything, Dundee University, Peer Educators Network, Joint Research Center and others. With special thanks to: Mara Balestrini, Ger Baron, Co de Boer, Pieter van Boheemen, Alessandro Bozzon, Jonathan Carter, Roberta Colavecchio, Guillermo José Rodríguez Fernández, Laurence Henriquez, Ester van der Geest, Christine van den Horn, Joske Houtkamp, Frank Kresin, Qijun Jiang, Folkert Lodewijks, Emma Pareschi, Edith van Putten, Cindy Regalado, Natasha de Sena, Pinar Temiz, Hester Volten, Maurice de Vries, Mathijs de Weerdt, Joost Wesseling and all the participants and supporters of the Lab.